Grootte van deze voorvertoning: 800 × 531 pixels. Andere resoluties: 320 × 212 pixels | 640 × 425 pixels | 1.024 × 680 pixels | 1.280 × 850 pixels | 7.780 × 5.164 pixels. English: The Pirate Publisher—An International Burlesque that has the Longest Run on Record by Joseph Ferdinand Keppler, published as a centrefold in Puck, v. 18, no. 468 (1886 February 24). A commentary on the state of copyright laws that, prior to a 1911 treaty, generally offered no protection to foreign authors and works. 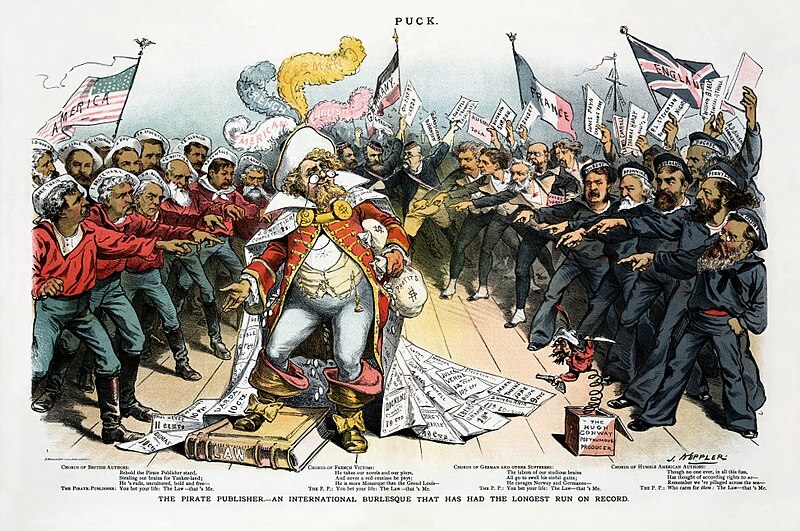 In the cartoon, hordes of German, Norwegian, French, English, and American authors surround a publisher who republishes their newly-created works without attribution or royalties in a foreign country, as international law then allowed. Of note is W. S. Gilbert, fifth from the right in the front row, as the many unauthorised or "pirate" productions of H.M.S. Pinafore caused him and Arthur Sullivan to première The Pirates of Penzance in America, to at least gain the initial profits there before anyone else could exploit it, and the title and subject of The Pirates of Penzance is sometimes - although somewhat dubiously in my opinion - considered to partially be a reference to the issue of pirate productions of their works. Other authors shown include Mark Twain, Tennyson, Robert Browning, F. C. Burnand, Émile Zola, Jules Verne, Victorien Sardou, Wilkie Collins, Oliver Wendell Holmes, Sr., as well as many others. This has been a very difficult restoration - there were actually 3 or 4 false starts as I tried to get around a very nasty crease in the original. I think it came out pretty well in the end, though. File:Joseph Ferdinand Keppler - The Pirate Publisher - Puck Magazine - Original LoC scan.png - Original scan from the Library of Congress, turned into a PNG as the original TIFF was far too large.